An estimated 40% of the world’s crops are lost to pests, impacting on smallholder farmers’ ability to feed their families, on international trade and food supply chains, and hampering the pursuit of Sustainable Development Goals 1 and 2 (No Poverty and Zero Hunger). The Centre for Agriculture and Biosciences International’s (CABI) Pest Risk Information SErvice (PRISE) is a £6.3 million project supported by the UK Space Agency’s International Partnership Programme (IPP). PRISE is working to transform the lives of farmers in Sub-Saharan Africa by providing a novel pest prediction tool, which combines cutting-edge Earth Observation technology, satellite positioning, plant health modelling, and on-the-ground real-time observations to deliver a science-based service. The first ‘Baseline’ version of the system is already live in Kenya, Zambia and Ghana, and the service is expected to expand into another 2-3 Sub-Saharan African countries by 2021. Strong working partnerships and the sharing of expertise are key to the delivery of this innovative project. CABI is collaborating with Assimila Ltd, Kings College London, and the Centre for Environmental Data Analysis in the UK and government agencies in Kenya, Ghana and Zambia to realise the project’s ambitious aims. In July 2018 the UK Space Agency team visited Ghana to meet with the PRISE partners and experience first-hand the excellent work being undertaken to develop the system. The packed 4-day schedule included 2 days of stakeholder workshops, during which project partners and stakeholders came together to share feedback on the first release of the PRISE system. The workshops enabled valuable discussions on how the system will evolve over the next few years to provide pest alerts for further crops and pests and reach more people and user groups. During the visit, the High Commission hosted a well-attended publicity launch to celebrate the release of PRISE Baseline, with speeches from the British High Commissioner to Ghana and the Director of Ghana’s Plant Protection and Regulatory Services Directorate highlighting the unanimous in-country support for the project. The final day of the trip provided the opportunity for the UK Space Agency to meet with small-holder farmers and agricultural extension workers (known as ‘plant doctors’) at a Plantwise Plant Health Clinic in the village of Duayaden. The clinics consist of group presentations and one-on-one ‘consultations’ in which farmers can discuss their issues related to crop pests and diseases and other challenges. 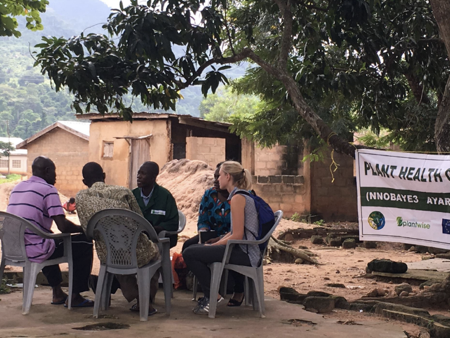 The sessions enable plant doctors to share their expertise – supported by Plantwise Knowledge Bank and PRISE predictions – with farmers to help them to prevent crop losses through effective pest risk management strategies. Watch a short video about PRISE here. You can read more about PRISE and other International Partnership Programme Projects in our new brochure. A new report written by Caribou Space, ‘Space for Agriculture in Developing Countries’, provides an introduction to why and how space solutions can help to tackle agriculture challenges in developing countries.